A KU faculty member since 2005, Henry Bial’s research and teaching specialties include performance theory, religious performance, Jewish popular culture, and theatre historiography. He holds a PhD in Performance Studies from New York University and a BA in Folklore and Mythology from Harvard University. 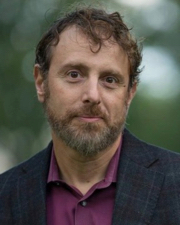 Dr. Bial is the author of Playing God: The Bible on the Broadway Stage (University of Michigan Press, 2015) and Acting Jewish: Negotiating Ethnicity on the American Stage and Screen (University of Michigan Press, 2005). He is also the editor of The Performance Studies Reader (Routledge, 2004; 2nd Ed. 2007; 3rd Ed. 2015), co-editor with Scott Magelssen of Theater Historiography: Critical Interventions (University of Michigan Press, 2010), and co-editor with Carol Martin of Brecht Sourcebook (Routledge, 2000). He has published articles in TDR , Theatre Topics and The Journal of American Drama and Theatre as well as several book chapters. He has served on the editorial boards of Theatre Survey, Theatre Topics, Ecumenica, The Journal of Religion and Theatre, The Journal of Dramatic Theory and Criticism, and The Cambridge Encyclopedia of Stage Actors and Acting . In addition to his scholarly pursuits, Dr. Bial has worked in a variety of capacities — director, performer, designer, playwright, dramaturg, and lighting operator — in university and professional theatres in New York, Kansas City, Boston, Minneapolis, and Albuquerque. A proud member of the Buran Theatre Company, he last appeared as The Man in the Purple Suit in The House of Fitzcarraldo . Dr. Bial is a former President of the Association for Theatre in Higher Education (ATHE), a comprehensive non-profit professional membership organization. Founded in 1986, ATHE serves the interests of its diverse individual and organizational members, including college and university theatre departments and administrators, educators, graduate students, and theatre practitioners. Bial, Henry, Brady, Sara (Ed.). The Performance Studies Reader. 3rd ed. London: Routledge, 2016. Bial, Henry. Playing God: The Bible on the Broadway Stage. Ann Arbor, MI: University of Michigan Press, 2015. Bial, Henry. "Performance Studies 3.0." Performance Studies in Motion: International Perspectives and Practices in the Twenty-First Century. Ed. Ati Citron, Ed. Sharon Aronson-Lehavi, Ed. David Zerbib. London: Methuen, 2014. 30-41. Bial, Henry. "Hot Pursuit: Researching Across the Theatre/Film Border." Journal of American Drama and Theatre 26.2 (15 Jun. 2014): 90-101. Bial, Henry. "Jew Media: Performance and Technology in the 58th Century." TDR: The Journal of Performance Studies 55.3 (Fall 2011): 134-143. Bial, Henry. "Today I Am a Field: Performance Studies Comes of Age." The Rise of Performance Studies: Rethinking Richard Schechner's Broad Spectrum. Ed. James Harding, Ed. Cindy Rosenthal. New York: Palgrave Macmillan, 2011. 85-96. Bial, Henry, Magelssen, Scott (Ed.). Theater Historiography: Critical Interventions. Ann Arbor: University of Michigan Press, 2010. Bial, Henry (Ed.). The Performance Studies Reader. 2nd ed. London: Routledge, 2007. Bial, Henry. Acting Jewish: Negotiating Ethnicity on the American Stage and Screen. Ann Arbor: University of Michigan Press, 2005. Bial, Henry (Ed.). The Performance Studies Reader. 1st ed. London: Routledge, 2004. Martin, Carol, Bial, Henry (Ed.). Brecht Sourcebook. London: Routledge, 2000.